Applejack had mulled it over for way way way too long. If she didn't do something about it pretty soon, ponies were gonna find out. She couldn't hide it anymore and if she kept trying she was just gonna burst! Every time she thought about it the farm mare's heart skipped a beat and then took to hammering away in her chest like she had just bucked a hundred apple trees bare! It was her first thought in the morning and the last thought every night. She just couldn’t keep it back any more. And so Applejack had taken the Princess of Friendship into her confidence. If she couldn't trust the princess then who could she trust? She didn't want anypony in her family finding out, not just yet anyway. AJ was seen in a certain light by her family and she didn't want that to change. She worried that letting on might make her seem weak. She certainly didn't want that! 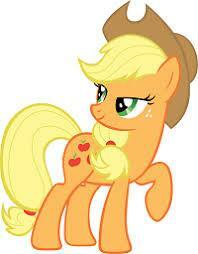 Applejack was many things but darn it all she was not weak and nopony would ever prove otherwise! But she had to admit...on this one she had weaknesses. Her heart was directing her head at this point and she needed help. "Twilight!" She opened the door and let her friend in. "So glad yah could make it!" "Sure Applejack! What did you want to ask me about?" Twi jumped in no holds barred. All she knew was AJ had asked for her help and finding out what she needed was definitely of interest. Applejack wasn't always keen on asking for help so this was something important no doubt! "Wow! huh huh..." She laughed nervously. "Yah uh mind if we walk and talk? Might make it easier for me to share?" Soon the two were walking through the orchard. After some small talk Applejack finally let the truth slip. "So yeah... all that tah say... I uh... I'm crushin' on Rarity somethin' fierce and I had tah tell somepony." The mare's cheeks blushed crimson as she let the secret go. She suddenly felt super vulnerable. "Wow..." Twilight's excitement rose! This was amazing news! "Thank you for trusting me with this Applejack. So, when are you going to tell her?" "Tell her!" Applejack exclaimed. "I could hardly tell you! How am I supposed tah tell her?! Just saunter up an' say 'hey there good lookin?' I don't think so!" "I'll help you AJ, don't worry about a thing!" The Summer Solstice celebration was taking place just a few weeks later and three days before the event a special letter was delivered to Rarity's home. As one of my closest friends I would like to invite you to a special viewing of the Summer Solstice Celebration at the Castle in Canterlot. Please arrive at the castle the night before the event. All your meals will be taken care of and you will have a private room as well. I've invited Pinkie, Fluttershy, Rainbow Dash and Applejack as well so it should be a fun day in the city for all of us! Canterlot. Oh, how she loved this city. It was the height of Equestrian nobility, the ideal of national thought and form. The glamour and sophistication that characterized the city was something that Rarity embodied internally so naturally that she always felt like a citizen of Canterlot trapped in a small town. Not that she minded her home but her heart was addicted to the grandeur of the Equestrian capital. Manehattan had its charms and Stalliongrad whispered seductively in the far north, but Canterlot was the jewel in her heart. When Twilight offered her the chance to participate in a special Summer Solstice Celebration at the castle of all places, she didn't have to think for nary a moment before accepting. Indeed, her schedule lined up well regardless and she was planning a trip to Canterlot the week after so it aligned, like the stars, rather perfectly for the busy mare. Perish the thought of her ever being too busy for her friends, however. Despite her burgeoning fashion empire demanding more and more of her attention and, admittedly, lessening her ability to simply enjoy the little things in life as much as she once did, she always ensured that she had the time for those she cared so deeply for. Indeed, all her friends were so busy nowadays. It used to be they could make a schedule and then abandon it, aware they could make it up the next day or sometime soon. No social event was out of reach nor a friend out of touch. Now a missed lunch or spa date between friends felt like a real missed opportunity. She didn't mean to be dramatic- they saw each other plenty enough, at the very least at the School of Friendship- but an element of casual camaraderie had slowly been replaced by something more time intensive. No matter. Any time spent with one another was time well spent regardless. So of course she replied positively to the invitation and packed for a nice little trip to the city, including some days after the Solstice was through. She was a little curious as to why there was a letter, of course. Why not simply ask Rarity herself? Honestly, Twilight could be so mysterious sometimes. Or was it obtuse? yes, obtuse. It smelled like something was up and you didn't need Shadow Spade to tell you that. She arrived to the city on the appointed night- why hadn't they all taken the train together?- and to the castle soon afterwards. It was busy with many festivities and she was a well known heroine to the Guards so walking into the main lobby was no issue. Nor was her fashion, not that it ever was! All she had to do was find her pesky, elusive friends and enjoy them and the Solstice! Keep it together! AJ muttered to herself and tapped her front hoof nervously on the table top. She tried to keep her breathing calm. Twilight knew what she was doing. There was no way her friend was going to let her down. The Princess of Friendship trotted into the tea room at the castle. "Applejack! I'm so glad you made it! Everything is going smoothly," She sat down at the table next to her friend. "You look nervous," She smiled, trying to instill confidence in the usually overly confident farm mare. "Ha!" AJ dropped her hoof back under the table and smirked. "Me? Nervous? No way! I'm as cool as an apple core in blizzard!" This was followed by her regular stream of half hearted laughter. "Well, everything is all planned out! And don't worry, I didn't tell the other girls anything!" Twilight prided herself on following details and not just telling everypony was a big detail! "Thank yah Twi, I don't know how I'd ever get up the nerve ta do this without yer help!" The summer sun was sinking fast and the solstice would soon begin! Ponies lined the streets of Canterlot to watch the spectacle while enjoying the warm summer air. Ponies with special invite also lined the rails of the castle though the promenade deck had been reserved for only the most special of friends. All of the Mane 6 had been invited to the promenade to watch the event in style! "Wee!" Pinkie gave off a happy squeal as she bounded forward towards Twilight. "Thank you soooo much for the invite Twilight! It's Summer Solstice party time!" "Oh, I just hope all our little friends can enjoy this as much as we do," Fluttershy lilted as she made her way out onto the deck with a collection of birds and bats flitting around her. AJ trotted out too though she didn't have as much to say. She was super preoccupied with what she was going to do later. "I'm so glad you all could make it!" Twilight hugged her friends tight. "It just seems harder and harder for us girls to get any time together lately!" "Seriously! It's gonna be so cool to just kick back and relax with you guys like the good old days!" Rainbow exclaimed as she dove in to land from somewhere above. "Yep!" AJ tried to shake off the nervous energy building inside her. "Let the good times roll huh?" Ahh, the activity of the city hummed along with all the excitement that it was known for in festival season, amplified by the presence of so many famous ponies. The Summer Solstice Celebration had morphed over the years from a small celebration with a few hundred to maybe a few thousand ponies to a national party day, most acutely felt in Canterlot itself. Row upon row of sales spoke to the commercial aspect of it, while musicians and entertainers of all stripes flooded the city for concerts and gigs and all the parties. Their faces were plastered on advertisements that lined the street and she could hear the far off vocals of some early performances, and the distant laughter of some comedy act. She was not here for any of that, however. She was there for her friends, and she followed the ticket to the royal palace, and from there a series of security points where her visage and ticket were enough to gain her entrance. In no time she was at the promenade deck and caught sight of her dear friends. To say that they were important to her was an understatement. While she was justly proud of her career and backbone, she knew for a fact that each and every one of them had enriched her being beyond her understanding in their own unique ways. Fluttershy's gentle nature had shown her kindness and patience in the face of adversity was to be justly rewarded in time. Rainbow Dash's will to achieve her dream had emboldened Rarity to achieve hers. Pinkie Pie's boundless enthusiasm for every aspect of life was infectious in all of the best ways, and gave Rarity a boost of energy whenever she caught sight of her transparently positive pony friend. Twilight Sparkle had shown Rarity that anything and everything was possible, that balance and fairness in all things was right and proper, and not to mention that due diligence was a sure sign of success. And then there was Applejack. A special case, if only because she had known the mare longer than the others and didn't think she had necessarily learned anything from her lately. Not because she hadn't learned a lot, mind you...but Applejack was as familiar to Rarity as a proper stitch. Mysteries had long ago been dispatched between them. She was a dear friend, her oldest acquaintance, and one of the best mares she knew. "Hello, everypony!" She said with a cheery entrance, head held high as she entered the promenade. She struck a pose when she had their attention, so as to better accentuate her outfit. She wore a winter hat and a fine coat with faux white furs with two matching pairs of aquamarine booties, also topped with faux fur. "I came dressed for the occasion, no?" She giggled and tittered before hugging the closest of her friends. "So good to see you! And such a special occasion to boot. I cannot imagine seeing the Summer Solstice in a better location than this. Thank you dearly, Twilight. Though I must ask, why this one? Something special about this Summer Solstice? You wouldn't be taking over Celestia's celestial duties now, would you?" She winked as part of her frivolity, though a part of her couldn't deny that with Twilight, almost anything was possible. AJ gulped quietly as Rarity made her entrance to the promenade. She looked even more stunning than usual in that fancy get up. The farm mare couldn't really understand why the unicorn liked the dressin' up stuff so much, but hay, if it made you look that good then why the heck not? She cleared her throat and rubbed up under her forelocks for a moment. She had to stay calm and strong. That was who she was and who she'd always be! Nothin' a pretty unicorn was gonna do to change that! Even as they interacted with their friends AJ's nerves failed her yet again. As she was pulled in for a hug the scent of Rarity's perfume filled her nostrils. She couldn't help but inhale deeper before they stepped apart. Being close to the unicorn made her weak in the knees to say the least! "Well, Celestia and Luna promised me a special display for the sunset of the longest day of the year!" Twilight spoke enthusiastically. It was true that the other Princesses had promised something special for this year and asked Twilight to invite all of her friends to see it. It just so happened that AJ had asked for her help not long after she had been told that something special was already being planned. Everything had worked out too perfectly! "That sounds like it's probably somethin' really good!" AJ trotted over to the Princess. "I wonder what it is..."
The girls spent time talking and and relaxing on the promenade. It was a glorious evening, if a little on the chilly side for this time of year. Applejack gazed out over the crowds of ponies in Canterlot, her eyes resting on the slowly setting sun. She had know Rarity for such a long time. Much longer than the others. They had always been close friends. They understood each other. When just the two of them were together things just naturally clicked. It had taken a lot of years for the feelings she had to build up. AJ knew that part she loved the best about Rarity was that they just felt right together. Natural and free. However, bottling up her feelings was taking that away from her. That's why she had resolved to let her feelings show. She had to tell Rarity. Sure it would probably mess with their friendship some if the unicorn didn't feel the same way. At this point it was a gamble she was willing to take! A short while later members of the royal guard starting setting a table on the promenade. This was soon laden with food and drink for Twilight and her friends. "Looks yummy!" Pinkie proclaimed as she popped a candied apple slice into her mouth. "It is yummy!" She giggled and dug into the food. It would stand to reason that if they were being invited up here that the Princesses may have something up their royal sleeves. After all, it had been a number of years since this special collective had been formed and the Princesses rarely invited them as a group to anything less than some sort of unique event. It usually ended with them saving Equestria. Hopefully this 'something special' wasn't that because it had become a bit trite over time and she had just enough of this adventuring malarkey, thank you very much! "Oooh, sounds splendid. Hopefully it won't be the sort of special that ends up with us having to save the world again. I'm not dressed for that activity, not tonight," she said with more than a little hint of concern. After all, there was rarely a time when it seemed like her concern could be called misplaced. Luckily, even if rarely was she wrong when she allowed her concern to show, she was around the proper ponies in case pessimism was shown to be wise. The food arrived and soon Pinkie Pie was on it, with the rest of her friends no doubt close behind. Rarity might have some later but at this moment she didn't really feel like eating. Being here with her friends was good enough nourishment for the fashionista's feisty soul at the moment. Honestly, for as silly as it sounded it was true. They all did something important in making her feel whole. She once heard that Equestrians existed substantially in a world of almost universally unyielding kindness, where uncouth and unkind elements were the exception rather than the rule and this seeped into how they had evolved. Maybe Twilight could tell her if any of it made sense but she had to say that she didn't feel the need to eat as long as she was enjoying the fine company gathered tonight. In time however, everypony moved over to the food and so did Rarity. She wasn't going to be impolite, after all. "A small bite can't hurt my figure tonight, I suppose," she said with mock concern and a smile as she moved and made small talk. "Rainbow darling, did you really not think to do something with your mane tonight? Part of it is still matted from a show. Tell me you at least showered!" "Fluttershy, that was a marvellous display when you got that manticore to calm down on the road out of town. What was his name, again?" "Pinkie Pie, did you SEE- or, more accurately, HEAR- Cranky and Matilda? I couldn't believe my own ears. I didn't think Cranky could laugh." "Twilight, you're getting better about presentation recently. Have you considered getting a formal design for your castle staff?" In time she made her way to the balcony, levitating the plate over the side while she threw her crossed front hooves over, gazing out over the city. It gave her some time to think. Applejack seemed odd, didn't she? SOmething about her seemed pensive, not as direct and actionable as normal. Was something the matter? If it was, she was bottling it up rather well. No matter. Rarity wasn't a mare who let stuff like that go, by the by. She searched for a topic...ahh, that would do. "Applejack, dear, come here. I think I spot an apple merchant down there. I wasn't aware your family had been contracted for the festivities tonight!" She asked excitedly, though it was mostly an excuse to pull Applejack closer and get her talking about something she was confident in. Applejack was somepony who operated on stability and if she was unstable she needed to be made stable in order to be comfortable. She knew her friend well. Well, she hoped she did!